Originally titled "Torna a Surriento" and first published in 1904. 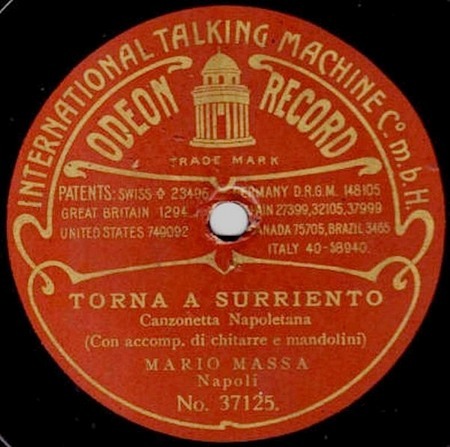 Most sources relate that the first recorded version was made in 1911 by Enrico Caruso for Victor. Not so. In fact, although Caruso performed the number, it seems he never recorded it! Doc Pomus and Mort Shuman wrote new words for Elvis's version in 1960. Versions with different words were recorded earlier, including one by Toni Arden in 1951. The original is actually dedicated to a man: in the September 1902, Prime Minister Giuseppe Zanardelli made an official visit to Sorrento. He stayed in a hotel, where Giambattista de Curtis worked as a painter. At the time, Sorrento was a mess, with bad roads, derelict houses and non-existent services. To encourage Zanardelli to improve conditions soon, de Curtis (Giambattista and Ernesto) wrote and dedicated this song to him, pleading that he return to a reconstructed and beautiful Sorrento. The song was written in just a few hours, but was modified soon after to produce the familiar version. Mario Massa carries the honour as first to record the number. He did so in June 1905 in Milan. His recording was issued on Odeon X37125.